In the earliest days of civilisation, when people first began to pay attention to the lights in the sky, they soon noticed that most of these lights seemed to hold their relative positions in a quite steadfast way. These they called the "fixed stars". Others, including the Sun and the Moon, seemed to follow a livelier, more random pattern. These they called "planets", or wanderers. In astrology, the planets, Sun, Moon and other movable points (such as the moon's nodes) are still all described as "planets", the wanderers of the zodiac. Each planet symbolises particular sides of our character; for example, Mars stands for action and passion, Jupiter stands for fortune and higher thought, and so on (see links to each planet in the table). Planets are located symbolically in the chart: the signs and houses filter their energies through the planets, much as a coloured lens filters the image thrown by a stage-light, or received by a camera. 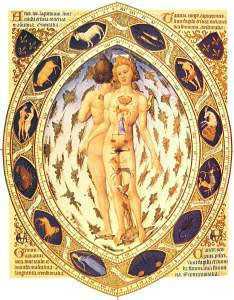 Planets are traditionally categorised by their elemental natures, their temperament, and their effects. These are mainly measured in terms of polarity, fruitfulness, distance from the Sun, quality and motion. Other related matters, such as colour, fragrance, angelic correspondences etc are dealt with elsewhere on this site. Venus and Jupiter are held to be benefic, or fortunate. Mars and Saturn are malefic, or unfortunate. Mercury is neutral, taking on the character of the sign and planet with which it is associated. The Sun is considered generally benefic in Western Astrology, except when badly aspected or in conjunction with another planet, which is then considered combust (burnt up). Indian Vedic astrology, however, considers the Sun to be malefic. The Moon is benefic, but changeable. The Moon's Nodes, the Dragon's Head and Tail, are symbolic points in the horoscope which have traditionally been given planetary strength. The Moon's north node is considered benefic and the south node generally malefic, but Vedic astrology considers them both to be decidedly malefic. The "modern" planets are still under consideration, but Uranus is widely considered malefic; Neptune neutral and Pluto malefic. It's hard to say whether Chiron (discovered in 1977) is really a planet, or more of an oversized snowball in space. Science leans to classing him as a comet nowadays, but many modern astrologers have taken to him with a vengeance, so I am including Chiron as a potentially benefic influence. Asteroids are really as yet undetermined, except that in my opinion Ceres has distinctly malefic tendencies. Any planet, even a benefic, can produce unfortunate results when poorly placed, so a clear understanding of the effects of its relationships is essential. No planet (nor any other astrological factor) can be adequately interpreted on its own, because the overall pattern of the celestial interplay defines the actual outcome. Moral Judgements, or Natural Processes..? Many modern astrologers think that the idea of malefic and benefic planets is now obsolete, as it implies the assignment of moral judgements to natural processes. They argue that all events and characteristics should be seen as part of a growth or development process, and that such categories are simply unenlightened value judgements – something of a hard sell to tsunami victims, casualties of war, car accidents, crippling diseases, or destructive relationships! Nevertheless, misfortunes are often lessened in their effects by taking the attitude that something constructive can come out of the problem. People often worry because they have been told that there are "negative" planets or "adverse" aspects in their charts. In the ultimate reality, which transcends our everyday personal world of feelings and relationships, there can be no negative planets or adverse aspects, for at a higher level, all things come to us for our essential benefit, generated by the interlocking karmic system. This is a purifying and energising process that builds our soul and develops our growth in consciousness. Problematic issues that arise, even or especially when frustrating, painful, or tragic, can be seen as triggers which are designed to awaken a higher level of awareness that would otherwise lie dormant. However, this hardly lessens the pain. It would be pointless to deny that suffering exists and has its place in the overall scheme of things, but equally pointless not to offer a clear warning when planetary configurations reveal that evils are impending. To say that sorrow and suffering are of no importance, or even that they are misinterpretations of the data, is to lessen the experience and reality of the facts. But the experience of suffering needs to be guided wisely. As any Olympic athlete can tell you: no pain, no gain. It is an interlocking system that brings our consciousness and our bodies together with events and relationships which, when rightly interpreted, develop love, wisdom and understanding. Astrology in the right hands is a key to the complexities of life in the material world. And forewarned is forearmed. Geometrical relationships between planets in the chart are called aspects. These relationships affect and modify the energies of the planets concerned. Some aspects have been shown to generate problematic events in our lives, while others seem to smooth the path with relation to the areas governed by the planets, signs and houses concerned. Should a planet have difficult aspects, or be in an unsympathetic position in the zodiac, it is said to be afflicted. Its negative characteristics may be exhibited on occasions through unfortunate personality traits, or through difficult circumstances arising in life. Malefic planets and difficult aspects generally signal problematic circumstances and unfortunate outcomes; these are the direct result of karma. Even benefic planets can also have unfortunate effects, when poorly placed or aspected. These situations are said to be karmic, in that they are designed to awaken our consciousness, usually through suffering of one kind or another. Should a planet have favourable aspects, its effects will be more beneficial. In general, any planet which is well-placed in the chart and well-aspected has positive effects, and in the case of malefics often any problematic effects are reduced or modified. Benefic planets and aspects tend not to cause the same karmic suffering, as they show the ways in which we can achieve satisfaction through the expression of our natural gifts. Difficult aspects, especially to the malefic (dangerous) planets, are often quite problematic and can even be catastrophic in their effects. They are, naturally enough, more conducive to personal development, for they tend to generate complex results requiring considerable interpretation and self-analysis, while favourable aspects more often produce simple effects that are easy to understand. In any case, the chart must be viewed as a whole, for positive and negative characteristics may cancel each other out, or appear in mitigated forms, according to circumstances depending upon other factors. We should always remember that it's "the set of the sails and not the gales" that determine the way we go. Conjunction (0°) may be favourable, difficult, or both, depending to a great degree upon the nature of the planets involved. Other aspects, mainly based on Kepler's work with the musical intervals and that of modern writers like Marc Edmund Jones, can be important in certain circumstances, as can the midpoints between planets along with a number of other sensitive positions on the charts, but they are beyond the scope of the present discussion. These are the shorthand glyphs (or symbols) representing the planets. Note that planetary dignities for the outer planets (Uranus, Neptune and Pluto) are accepted by many modern astrologers, but there is no traditional basis for their assignment. Traditional astrologers deny that the outer planets have any rulership, exaltation etc, as this destroys the symmetry of the table of dignities. Their polarity and qualities are widely consensual, but are merely proposed until firmer evidence is available. These outer planets are not part of the traditional astrological schema, but since they evidently have some influence, we need to account for it in one way or another. Chiron and Ceres have no agreed characteristics as yet, though research suggests that Ceres is seriously malefic and Chiron may be ultimately benefic. It is wise to remember that, as Kepler points out, no planet is essentially malefic or benefic, but needs to be viewed in its aspectual context in order to understand its influence in a given set of circumstances. Each glyph symbolises one or more particular functions of the planet represented. Click to view a Table of Planetary Values, showing a calculus for the dignities and debilities of the planets in chart interpretation. For definition of terms, see our comprehensive Astrological Glossary.